Nottingham has a great variety of bars and restaurants, and Chino Latino manages to combine them both; a Latino style bar serving all manner of cocktails, and a contemporary Pan-Asian restaurant. Even better for visitors to this historic city, Chino Latino is located on the ground floor of the Park Plaza Hotel along Maid Marian Way. This fantastic location is within quick reach of the Old Market Square for those wanting the frenetic nightlife of the city, and only a few minutes from Nottingham Castle, Nottingham Playhouse, The Royal Centre and High Street for those wanting the arts and shopping. We were greeted warmly at the reception desk by Nora, the venues manager, and shown to our table. A lovely young man by the name of Frazer was to be our server for the night and he got us sorted with water for the table, lager and wine, and handed us the extensive menus to look at. 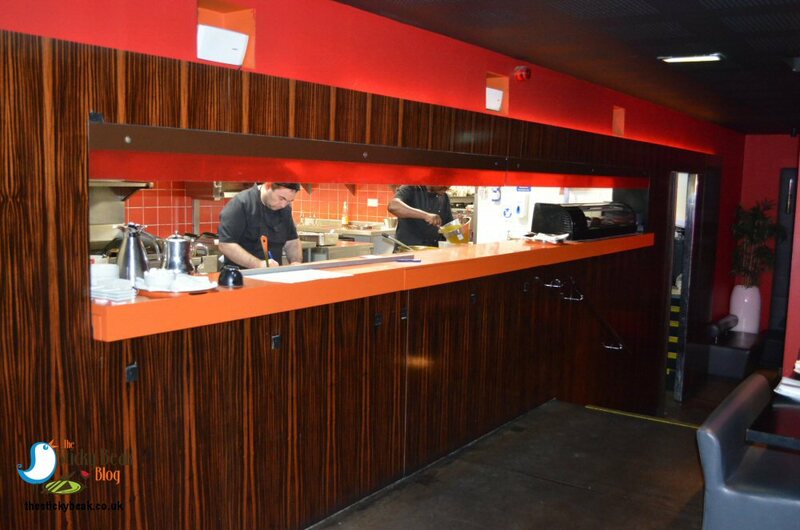 Chino Latino is very modern and sleek in its design, and I wondered if it had been done according to the principles of Feng Shui. The subtle, dimmed lighting creates an intimate, relaxed ambience and the flickering light cast over the table by the oil burner in its crackle-glazed holder only enhanced this. 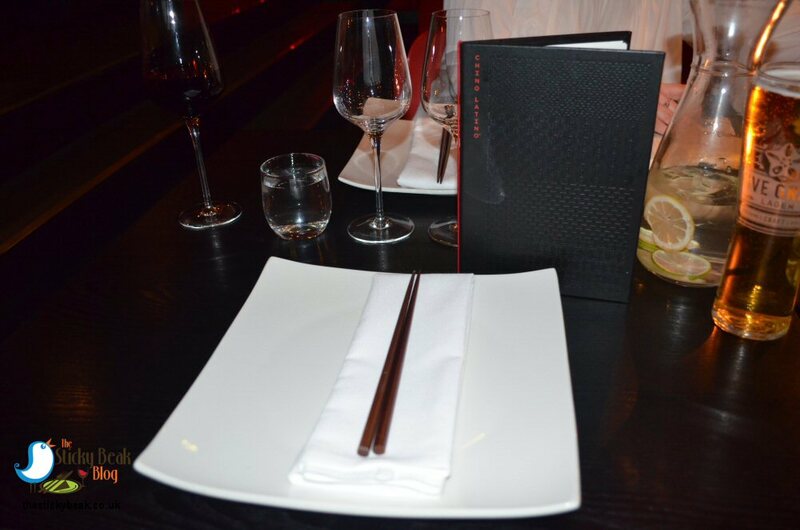 The black tables are cleanly set with white platters, black chopsticks and precisely folded white cloth napkins. The walls are either painted red or black and some have a textural finish to them for visual interest, which distracts you from the fact that there is no artwork on the walls. Planters of Bamboo are arranged around the room to keep the space clean and uncluttered, but subtly decorated at the same time. Chino Latino is a multi-level venue, and at the top of the small set of steps is the open plan kitchen – of which we had an incredible view from our table. 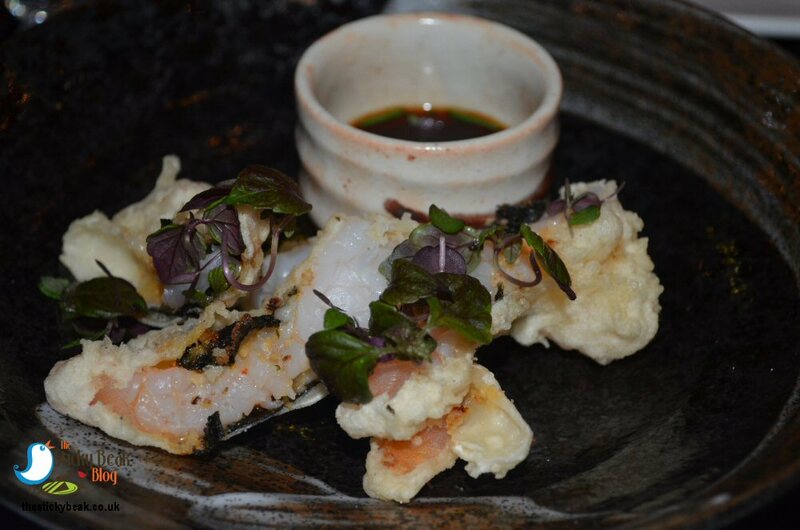 Having thoroughly scoped out my surroundings I turned my attentions to the menu, settling on Prawns wrapped in Shiso Leaf with Ponzu dressing from the Tempura section of the menu for my starter (£6.50). The Man Bird went for the Beef Taco with Avocado purée, Chipotle and Miso (£6) to begin his culinary journey at Chino Latino. My Tempura Prawns were beautifully presented in a sleek, decorated black bowl and it was clear that every single element had been carefully placed there. Gossamer light batter lovingly encased the large succulent Prawns whose flesh lingered sweetly on my tongue. The Shiso leaf had a lightly fragrant flavour to it; a little hint of Clove seemed to come across to me, not too much but enough to make my taste buds curious. Ponzu has a complex character to it that is perceived to be sweet, sour and salty all at once, and it worked really well in this light starter. 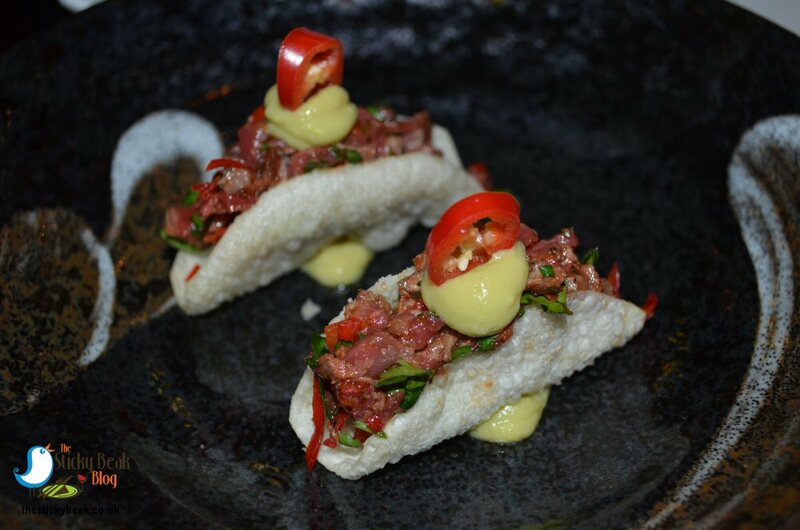 His Nibs was equally impressed with his Beef Taco from the Dim Sum section of the menu; it came in the same style bowl as my starter had been in, and again everything had been precisely arranged. This was a cold starter, not the warm Taco you may ordinarily expect. The tender minced beef was velvety soft and melted almost immediately in his mouth; the spice took its time to move from the front to the back of his mouth, revealing its layers of flavour as it did so. Creamy Avocado purée tempered the spices’ heat nicely, aided in its success by the subtle smoky edge of the Chipotle. What The Man Bird really liked too was the fact that the Taco was ultra-crispy and held its shape when bitten into, rather than shattering into pieces as per usual. For my main course I had chosen the Black Cod with Spicy Miso (£35), something I’ve always wanted to try, and this is Chino Latino’s signature dish. 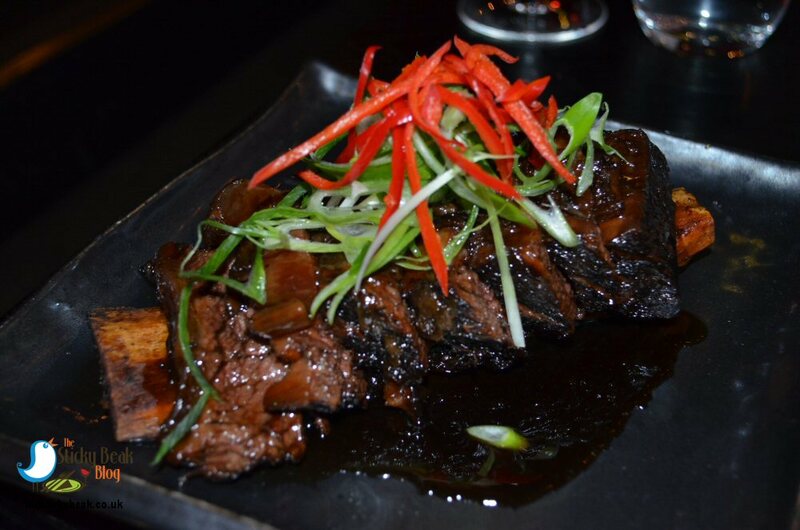 The Man Bird had Slow Cooked Prime Beef Short Rib with Teriyaki Sauce (£19). 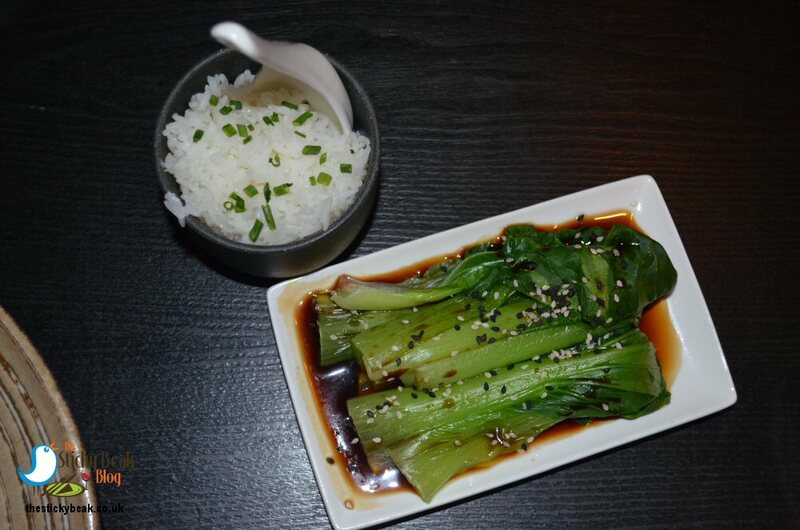 We also ordered sides of Steamed Bok Choi with sweet Soy and Sesame (£4.50), and Jasmine Rice (£3). Both mains came out with the same exquisite presentation and attention to detail as the starters, and we took a moment to savour their beauty before tucking in. Black Cod is a curious fish, and if ever there was a misnomer for a fish this would be it; it isn’t black in colour and it isn’t a member of the Cod family either! This deep, cold water living fish is similar in size and shape to Salmon and the environment in which they live and feed means they store a lot of fat as Omega-3 oils; in fact, they have the highest Omega-3 content of any white fish, more than some Salmon species! This high fat content gives Black Cods’ flesh a characteristically silky texture and an intensely rich, buttery taste – little wonder that (alongside Sablefish) the other name for Black Cod is Butterfish. Common ingredients in Asian cooking such as Soy, Ginger and Miso seem to exaggerate the Black Cods natural taste and texture, bringing it much more vibrantly to the fore. 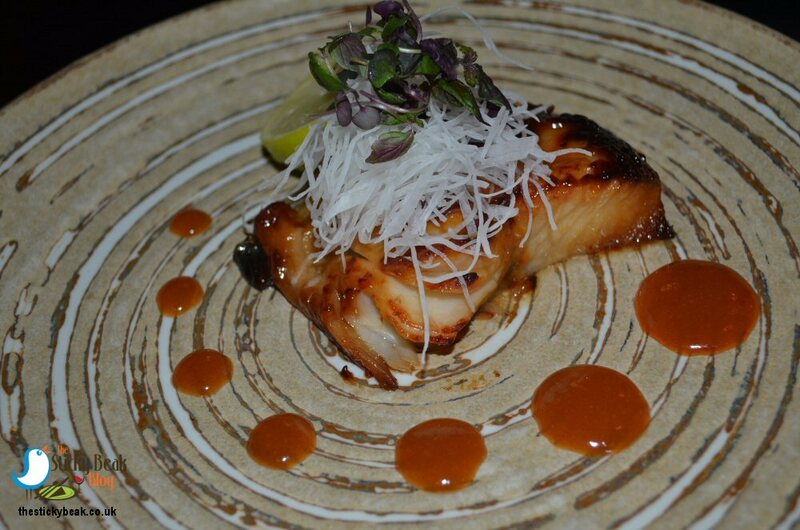 Chino Latino’s Chef clearly has a rich understanding of Black Cod and how best enhance to it, pairing its dense silky flesh with a gorgeously sweet-yet-salty, sticky Miso glaze that had a gentle cinder hint to it. This dish was easily the most expensive item on the menu but it is worth every single penny; my mouth was in total raptures at the complexity of sensations this dish reveals. Sometimes you really do get what you pay for, and this is one gourmet experience that will forever stay seared in my memory. Given the sumptuousness of the Black Cod with Spicy Miso, I was glad that I had chosen a fairly humble accompaniment for it in the form of Steamed Bok Choi with Sweet Soy and Sesame. Wedges of verdant Bok Choi had been carefully steamed to retain some of its natural structure; its gentle taste was delicate on the palate and the firmness gave a lovely textural element to the dish. The soy dressing wasn’t overtly salty either which meant that the nuttiness of the Black- and White Sesame seeds came through nicely. All that can be said about His Nibs’ slow cooked short rib is that it was simply an absolutely stunning piece of Beef! It had a gorgeous, deep flavour whose natural resonance was harmonised with a rich Teriyaki sauce. Chef had cooked the meat to perfection and it just caressed the tongue before melting sensually away in the mouth. Again, this dish requires the simplest of partners, so the gently fragrant Jasmine rice was the perfect choice. The combined gluttony of The Man Bird and me is no secret, but we do try to rein our excesses in most of the time. On this occasion, and I’m unashamedly throwing Chef under the bus here and blaming his skill, our attempts at self-restraint failed miserably! 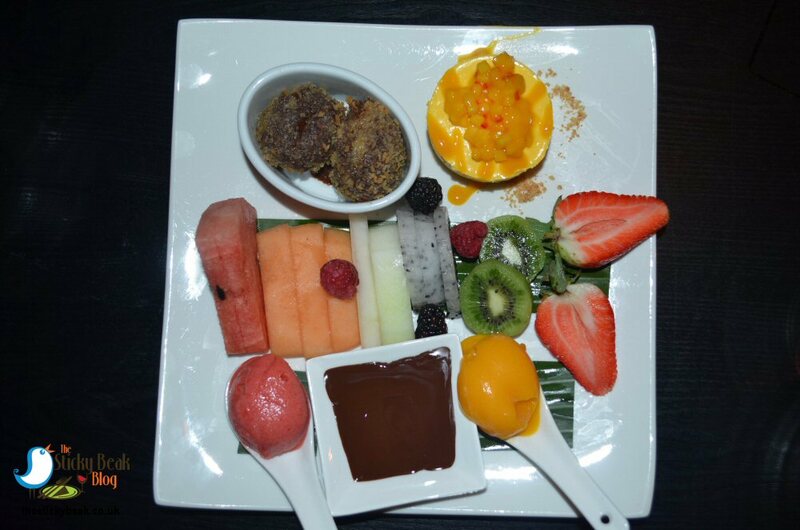 We had both fixated on the Chocolate Fondant with White Chocolate Sauce and Ginger Ice cream, but the Chocolate Tempura sounded intriguing – plus I fancied some fresh fruit, so the Exotic Fruit Salad was calling to me. Then there were the yummy Sorbets and Mango Cheesecake as well; excuse my language, but damn you Chino Latino, your dessert selection was just over-whelming!! Nothing for it then but to wave the white flag of surrender and order the Chocolate Fondant (£6.50) AND the Dessert Platter (£13) ; a smorgasbord of Chocolate Tempura, Mango Cheesecake, Selection of Sorbets, and Exotic Fruit Salad. Frazer looked at us and smiled, saying “are you sure?” Yep, bring it on; gluttony or bust! 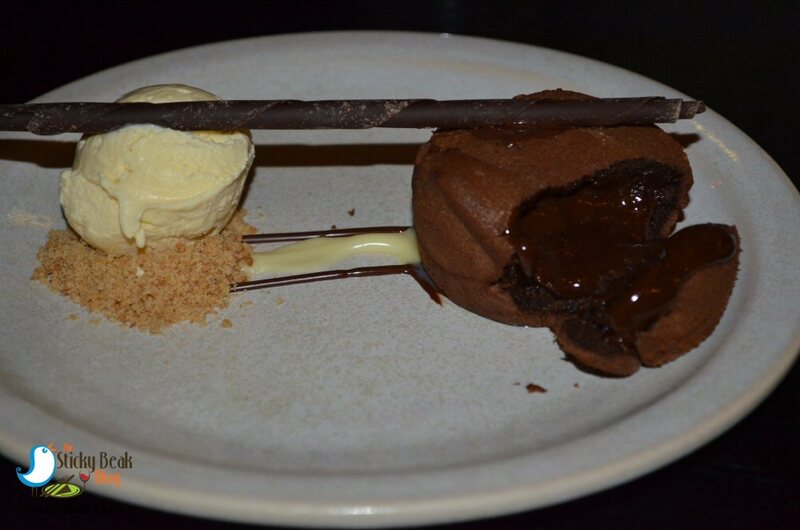 The Chocolate Fondant with White Chocolate sauce and Ginger Ice Cream is exactly what you dream of; a light crust on the outside that yields to the spoon and reveals a molten lake of chocolate indulgences inside. Utterly exquisite is the only way to describe it as it reclines on your tongue, gliding over every taste bud and revealing its richness slowly and seductively. The creamy White Chocolate sauce was delicious in contrast to the darker chocolate in the fondant, and the delicate warmth from the Ginger in the Ice Cream was marvellous too. Texture-wise, I think the Mango Cheesecake is the nicest I’ve had anywhere; silky and yet velvet-dense. The delicate perfumed character of the Mango was also accurately represented within the body of the Cheesecake, and tiny pieces of fresh Mango enhanced this aspect even further on the palate. The Chocolate Tempura was just other-worldly! Chino Latino’s dessert Chef needs recognition for this effort; it had a pleasingly crunchy outer that revealed a silken, warm, liquid chocolate inside. I particularly liked the coarser texture of the outside layer’s crumb and the fact that, despite being fried, there was no hint of greasiness or residual oil taste at all to this morsel. Chino Latino offer four Sorbet flavours: Kiwi, Guava, Mango, and Lychee; we had the Guava and Mango ones on our dessert platter. Both versions were sublime and weren’t overly sweet which allowed their respective fruits’ true nature to shine through. These sorbets were delicious by themselves, but when paired with pieces of fresh fruit from the Exotic fruit salad they were transformed into something extraordinary. 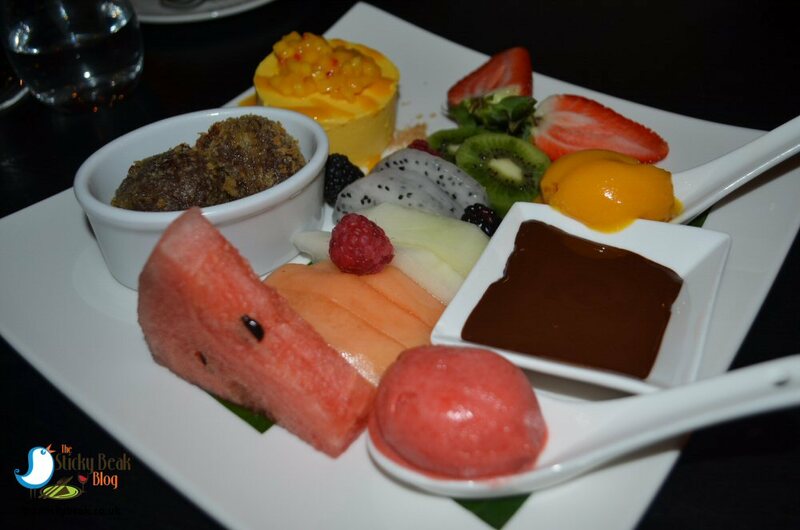 The fresh fruits also came with a bowl of melted chocolate for dipping, so with gleeful abandon and copious gluttony, I worked my way through the Strawberries, Raspberries, Watermelon, Honeydew- and Galia Melon, Kiwi fruit, and Blackberries until they were all gone. Oooh this is a dirty job sometimes, but someone has to do it (and I thank my lucky stars every day that it’s me!). Somehow we managed to find a space for coffees to bring the evening to a close, and a rich, smooth blend it was too. Nora, Frazer, and the rest of the Chino Latino team had made our evening a memorable occasion and we reluctantly left to make our way back to The Nest. 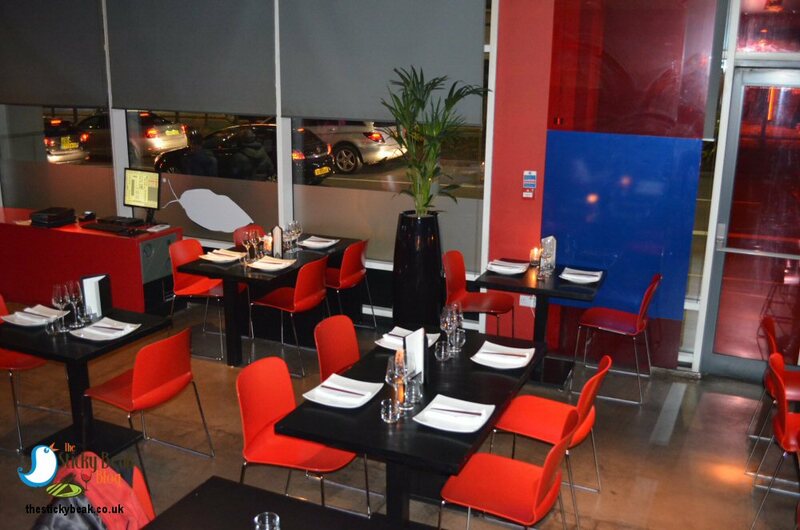 You can discover the delights of Chino Latino yourselves Monday-Thursday Noon-10pm, Friday Noon-10.30pm, and Saturday 5pm-10.30pm – the venue is closed for food orders on Sundays. I would advise booking ahead to reserve your table, especially if you have a larger group. Hot Wings most definitely awarded to this fantastic Nottingham venue!